for these Technical Jobs in Delhi High Court Recruitment through online using the recruitment link @ www.delhihigh court.nic.in. High Court of Delhi has published total 60 JJA vacancies, which are filled through written examination and Interview. Application forms filled in online mode and submit from 04-01-2019 till 23-01-2019. Offline applications will be rejected. Written examination date will be announced later. Applicants are suggested to visit Court website regularly for updates. 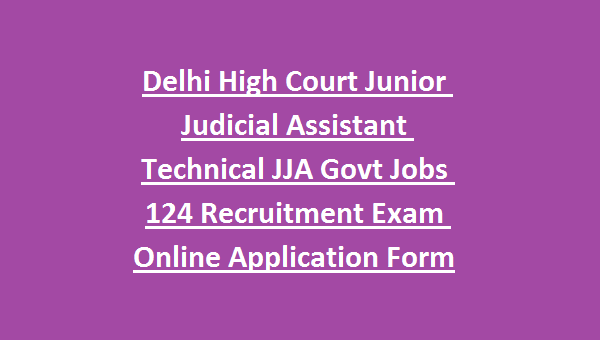 Check the blow information of Application fee, Application Procedure, Selection procedure, age limits, Essential qualifications for Delhi High Court JJA Jobs Recruitment are given below. Date of Commencement of Online application registrations: 04-01-2019. Last date for Online application registrations/ Making Payment through Debit card/ Net Banking/ Bank Challan: 23-01-2019. Last date for updating information of payment through SBI Branches: 23-01-2019. 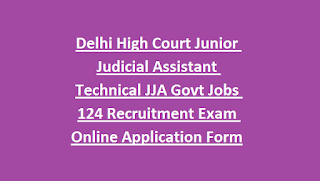 Total JJA vacancies available in High Court of Delhi Recruitment are 60 posts. Post Name: Junior Judicial Assistant/ Technical : 60 posts. Minimum qualifications required for Junior Judicial Assistant Technical Posts is Computer Science Degree/Engineering from any recognized university. Candidates minimum age should not be below 18 years and maximum age should not be above 27 years as on 01-01-2018. Maximum age for SC/ ST is 32 years, and for Back ward classes is 30 years. Salary for Jr Judiciary Assistant Jobs is as per Delhi Government norms. Eligible Candidate will be called for following tests. Non refundable application fee for Male General, OBC candidates is Rs. 300/-. Application fee is Rs.150/- for Scheduled caste, Scheduled Tribes, PWD, Woman candidates and Ex- Serviceman. Eligible candidates who have completed Graduation can apply for JJA Technical Jobs in Delhi High Court Recruitment using the Delhi Court official Web link @ www.delhihighcourt.nic.in. Applications can be filled online and submit before 23-01-2019. Candidates who have qualified in written test will be called for Essay writing test. Minimum qualifying marks of all test are given below. -Written Test- 90 marks out of 180 marks for General candidates and 81 marks for others. -Essay Writing Test- 25 marks out of 50 marks for General candidates and 22.5 for others. -Interview- 11 marks out of for General candidates and 09 marks for others.